This disapproving impression sustained me for almost a decade, during which time I steered our winter family vacations far away from the sunshine state and toward my favorite winter alpine pastimes. My two daughters, however, are tiring of ski trips, and greet my enthusiastic suggestions for new destinations with a disturbing ennui. They envy their friends, who return with invariably glowing reviews of warm sunshine, Caribbean hair braids, and beach vacations. Their demands for a trip south can no longer be dismissed. My wife, whose passion for alpine vacations had mysteriously disappeared soon after our marriage, welcomed their revolt, and lent them her support. Thus outnumbered, I surrendered. The price of defeat -- almost two weeks at grandma's house in Florida, was sweetened by my wife's promise that we would leave the kids for one or two nights -- our first time alone since the birth of our third child two long years ago. In the months before our departure, I did my best to prepare myself to make the most of our upcoming holiday. I learned how to scuba dive and scouted out the myriad opportunities for dives along the coast north of Miami. Even more important, I approached this trip, not simply as a visit to the in-laws as I had in the past, but as another travel adventure. I checked out the area's offerings on the internet, bought a couple of guide books, and phoned the local chambers of commerce for their information packets. This change in attitude, my newly acquired underwater skills, and days of uninterrupted Florida sunshine convinced me of the error of my former ways. At the risk of endangering another family ski vacation, I'm not the least embarrassed to admit that we had a lot of fun in Florida. For our honeymoon, my wife and I spent an idyllic ten days on Florida's Dry Tortugas, swimming with the barracudas, sleeping in a tent, eating whatever food we were able to deny the islands impetuous rodents and wandering around Fort Jefferson National Monument. The base camp of our latest Florida trip offered less of nature's ambiance, but more in the way of late twentieth century facilities. The condo pool -- usually empty during my early morning visits, was wonderfully sited along the inland waterway and surrounded by swaying palm trees. By late morning the families, including my own, began to arrive, each claiming its share of pool-side lounge chairs. The kids were happy to spend the entire day at the pool, and I, having already claimed my hour of solitary swim time, was content to let them. Although the beach is barely a mile from the pool, we had never ventured there before this trip. This was a mistake that we'll never repeat. There's nothing like a good ocean beach for hours of family entertainment. 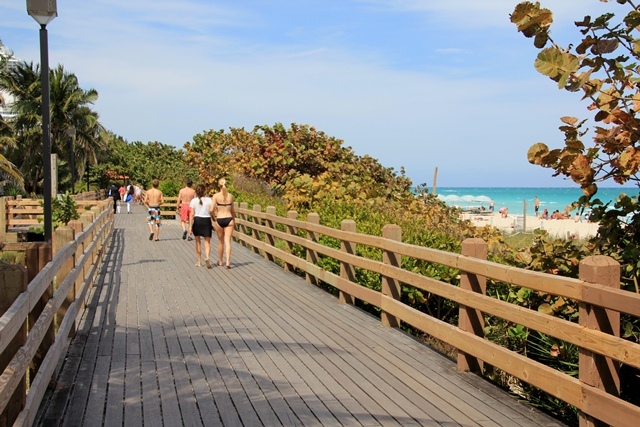 Almost anywhere along the famed Route A1A north of Miami it is possible to find a beach with the ingredients necessary for a good time. The winter water temperature compares favorably with that during the summer in my hometown north of Boston. The beaches are clean, the sand is perfect for castle-making, and the surf is kid-friendly [even if the occasional stinging jelly fish are not]. Lifeguards are plentiful. Lounge chairs can be rented for a nominal sum, as can sailing catamarans [for far larger amounts], and food and drink are never far away. In the evening, we often ventured just north of Hallendale to the Hollywood boardwalk in the evening. Instead of the infamous early bird specials, the girls would play a round of miniature golf before checking out the offerings at the numerous pizza parlors, small restaurants, and tee shirt and ice cream shops burrowed into seaworn buildings along the funky boardwalk. Large contingents of French Canadians have patronized this part of the coast for decades. Most are solidly middle class, and the ambiance of the boardwalk reflects their unadorned pursuit of value for money. We enjoyed a couple of delicious Turkish dinners at Hollywood's Istanbul restaurant. We had the good fortune of sitting at the one table on the boardwalk. After the kids finished their kabobs, they crossed the boardwalk to the beach's moonlit sandy expanse and played while we ate baclawa and sipped Turkish coffee. "At the risk of endangering another family ski vacation, I'm not the least embarrassed to admit that we had a lot of fun in Florida"
The Hollywood boardwalk harks back to a less prosperous and ostentatious past. The one in Ft. Lauderdale, which follows the beach on one side and a mile of so of new commercial development on the other, is a more accurate reflection of contemporary American tastes. The restaurants and bars are larger and more expensive and the boardwalk is laced with a fast-paced neon. Our one night away from the kids was spent in Ft. Lauderdale, at the Radisson Bahia Mar Beach Resort. Our accommodations were gratis after my wife suggested that management owed us for moving us at midnight from our room, which boasted a bed with a mysteriously wet mattress. No matter, the diving trip organized by ProDive, located right on the hotel's premises, more than made up for the minor inconvenience. The stunning coral reef in thirty feet of water just off the coast offered a poignant reminder of the beauty that still coexists, often precariously, in such close proximity to the Miami megalopolis. The Sawgrass State Park, just west of Ft. Lauderdale, is another such place. Once an air boat was the only way to reach Ft. Lauderdale, which was surrounded by sawgrass. For decades, the prairie-like expanse of swamp has been fighting a losing battle against development. Today the little state park opens a window on Florida's disappearing ecological and historical heritage. The park is a low budget affair with a tolerable number of visitors on the day we were there. The "Indian village" is probably an accurate reflection of how tenuous were the efforts of native Americans to insulate themselves from their natural surroundings. A variety of alligators and snakes languish in primitive, ill kept enclosures. The kids loved it. The ride in an ear splitting air boat [ear plugs provided] to search for alligator [we found one!] in the still lovely sawgrass was matched by the fun of caressing an alligator -- its snout securely taped shut -- and gazing at a panther. The place reminded me of the forlorn bears on display at New Hampshire's Clark's Trading Post. Most of these slightly out of time, politically incorrect attractions have been replaced by more modern, antiseptic family entertainment. Too bad, because my kids can't get enough of them year after year. I asked my girls aged 7 and 11 to pick out of a guide book one place they wanted to visit. Their unanimous, unlikely choice -- the American Police Hall of Fame on Maimi's Biscayne Boulevard. The reason: not only does the museum have old police cars and retired Harley Davison motorcycles for hands-on display, it also has realistic mock ups of an electric chair, a gas chamber, guillotine, jail and isolation cells, and all too-realistic models of the awesome effects of firepower on the human head. We passed quickly through the somber memorial to police officers killed in the line of duty to the more macabre exhibits. The museum was not one of my favorites, but like the trip as a whole, it helped me to see a family vacation to the Miami area in a new and far more positive light. Miami International Airport is located just west of the city in an unincorporated suburban area. It's an important hub for traffic between Europe, North America and Latin America. Fort Lauderdale International Airport is 25-40 minutes north of Miami proper, depending on traffic, and does not have nearly as many international routes. It only offers a small variety. By trainAmtrak's Silver Service operates two trains daily to Miami from New York City, Washington, D.C. and other cities along the Eastern Seaboard. By carThere are three main highways coming into Miami. I-95 runs along the Atlantic coast of the United States and terminates in Miami. I-75 comes in from the midwestern United States and runs through Atlanta and Tampa before terminating in Miami. Florida's Turnpike is a toll road mainly useful for those driving in from Orlando. The only southbound route from Miami is U.S. Highway 1, which runs through the Florida Keys all the way to Key West. By busThere are 5-10 major companies operating to Miami. Want to see your resort or destination featured on Family Travels? Get in touch. The stories on this website were accurate when published. Please be sure to confirm all rates and details directly with the companies in question, and stay up to date with current events to ensure a safe and successful trip.